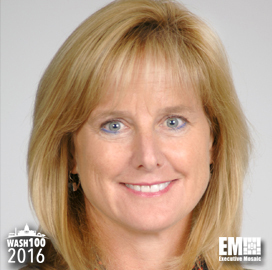 Executive Mosaic is honored to introduce Kay Sears, president of Intelsat General, as the newest inductee into the 2016 edition of the Wash100 — Executive Mosaic’s annual selection of influential leaders in the government contracting arena. The 25-year satellite communications industry veteran has led U.S.-based Intelsat subsidiary for 10 years. Sears told ExecutiveBiz in an October 2015 interview that the U.S. military should develop a communications architecture that accommodates commercial technology and establish the needed security requirements as industry works to provide capability and capacity in support of government. “We are building and developing new satellites all the time but if we don’t understand the future architecture and the supporting applications, it is hard for us to make investments that target those capabilities,” she said. She also highlighted her belief that increased government-industry partnerships are needed amid tight budgets and schedules for satellite programs. Sears is a former a member of the National Security Telecommunications Advisory Committee in 2009 and has contributed to the launch of the government services organizations at Verestar and Panamsat subsidiary G2 Satellite Solutions. She currently sits on the board of the Space Foundation and the Virginia Commercial Space Flight Authority, and is a recipient of the National Defense Industrial Association’s 2014 Honorable Peter B. Teets Award for her leadership in efforts to leverage space technology for national security. Executive Mosaic congratulates Kay Sears and the Intelsat team for their selection to receive this award.